A family wedding a few days ago, causing a gap in this blog, means that we have not yet discussed the pronunciation of the Icelandic volcano that is causing such unprecedented air traffic disruption in Europe. By now everyone else has, though. Here is the advice from the BBC pronunciation unit. The BBC’s formulation does not use IPA, relying instead on its special respelling system. Interestingly, the headline replaces the character ö with oe, which seems very lame. So do the maps below. I suppose it’s better than Eyjafjallajokull (no diacritic), which is what some of our newspapers have been printing. For an IPA rendering you’ll have to turn to Wikipedia, which tells us that it’s pronounced ˈɛɪjaˌfjatlaˌjœːkʏtl̥. I think, though, that many of us would find it a challenge to come up with precisely that on the basis of the sound clip supplied. Language Log offers us not only a number of rival versions pronounced by pukka Icelanders but also a selection of feeble attempts by non-Icelanders, including a Youtube compilation of newsreaders’ efforts. I have to say that for Icelandic final/preconsonantal ll I’ve always been tempted to write tɬ rather than tl̥. I hear quite a bit of friction in the lateral component, so that we have a voiceless alveolar lateral affricate. I have a friend named Hallgrimur, whom I call ˈhatɬkɾɪmʏɾ̥, I hope correctly. There’s an article about Icelandic phonetics here. Henry Porter in yesterday's Observer came up with "AYA-feeyapla-yurkul". "Helen Marsh" (Catherine Tate) shows how to do it at 1:20 in this video clip. There's an interesting comment by Suzanne Kemmer in the original Language Log entry on the pronunciation of Eyafallajokull (sorry, I don't have easy access to diacritics). She mentions that her husband, who is from Yorkshire, pre-stops his laterals just like the pronunciation of "ll" in the name of the volcano (apparently a regular feature of Icelandic phonology), and that she has heard similar pronunciation elsewhere in the north of England. There is a suggestion that this might have something to do with Scandinavian. Prof. Wells, I was wondering if you have encountered this phenomenon in your study of accents of English and whether you might have some thoughts about its origins. Thanks for discussing this. I was curious. in [tɬ] I would expect the [t] to have lateral rather than alveolar release. Is this the case, and if so would it normally be indicted in the IPA? Before I re-invent the wheel in deciding how to Anglicize that name, how do you normally pronounce the last syllable coda of Nahuatl when speaking English? in [tɬ] I would expect the [t] to have lateral rather than alveolar release. Is this the case, and if so would it normally be indic[a]ted in the IPA? Yes, it is the case. Not specially indicated: it's implied. If you wanted to be absolutely explicit, you could use the lateral-release diacritic [ˡ], thus [tˡɬ]. See the IPA Handbook or the IPA Chart. I've never come across the feature reported by Susan Kemmer. I wonder if it was a personal idiosyncrasy of her husband. And you don't get it in Swedish, Danish or Norwegian, as far as I know. Nor do you get it for the plain Icelandic l, only for the spelling ll. The BBC News at 10.00pm last night had almost 20 minutes coverage of the Icelandic eruption and its repercussions. 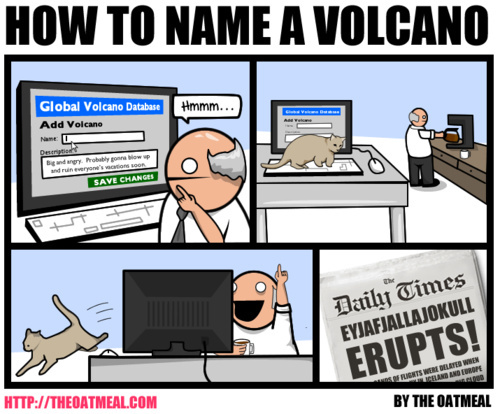 It was noticeable that not once was the name of the volcano mentioned. The wimps! "you don't get it in Swedish, Danish or Norwegian,"
Apparently, to judge from the Language Log comments, the phenomenon of the pre-released lateral l shows up in Faroese, as well as some Norwegian dialects and possibly some Swedish dialects, too. Well I came to this even later, but listened a ridiculous number of times to John's sound clip from Wikipedia, since it was immediately apparent that it was not so much a challenge to come up with precisely [ˈɛɪjaˌfjatlaˌjœːkʏtl̥] on the basis of it as an impossibility. Not only am I in total agreement with him in hearing more than enough friction to call the finall ll a voiceless alveolar lateral affricate, but in this particular clip I would want to call the medial ll a voiced ditto. However I took on trust the phonetics and implied phonology of [ˈɛɪjaˌfjatlaˌjœːkʏtl̥], since without it it would be barely possible to recognize this clip as speech of any sort, and with that as a crib/training device, I had definitely decided by about the hundredth attempt that what I was hearing was ˈɛɪɛvʲædɮɛˌœˑɡʏtɬ, provided I was prepared to be very generous about the vowel qualities and quantities. It will be obvious that I was less generous about the degree of voicelessness of the consonants that do seem to be there. I have since read all the Wikipedia stuff about Icelandic which John links to, and just about everything there is on the Web about this name, and I still can't hear this clip from Wikipedia (contributed according to Language Log by Jóhann Heiðar Árnason), in any of its multiple incarnations on the Web, as anything but ˈɛɪɛvʲædɮɛˌœˑɡʏtɬ. But also there are plenty of other clips of native speakers that are both more and less reductionist. For some of the latter, Wikipedia's [ˈɛɪjaˌfjatlaˌjœːkʏtl̥] seems just fine (apart from the apparently universal final [tɬ] one hears), but is variously characterized as "hypercorrect" or "hyperarticulated", which I find unnecessarily ungenerous to the native speakers, however ungenerous I may have been to Wikipedia's transcription, which on the contrary I consider vindicated. Voicing of the relevant consonants morpheme-internally is acknowledged by various sources, and in such allegro speech it seems unsurprising that morpheme-initial f should likewise be voiced as here. Here's a non-phonetic explanation of the name: link. To me the both ll's sound quite like a Welsh ll only somewhat plosive. I heard quite a bit of friction in the lateral component, I was prepared to be very generous about the vowel qualities and quantities. aya fyaddla yirkuddl. That LL sound is similar to the one in the english words "fiddle" and "cuddle". I did. I said I heard more than enough friction to call the finall ll a voiceless alveolar lateral affricate, but in this particular clip I would want to call the medial ll a voiced ditto. That may have been opaque to anyone with as sensible a view of how to represent the pronunciation as you, but perhaps my transcription ˈɛɪɛvʲædɮɛˌœˑɡʏtɬ makes it a bit less opaque. The dɮ is indeed similar to the ddl of fiddle etc, but with more friction in the l, as indicated by the special symbol ɮ. Is that perhaps why you say "similar to" instead of "like" etc? On the other hand you may well not perceive it as particularly different. You may even use the fricative l in this context in English without anyone noticing! So I'm gratified to see this voiced LL recommended by a native speaker. And I'm not surprised you give it for the final ll as well as the medial one I too identified. I guess you would automatically devoice it to a greater or lesser extent in final position. I guess too that the voiceless medial ll generally recommended as the "careful" pronunciation is historically parallel to the devoiced initial G of your name. And that in the modern language it is no more surprising for it to get voiced intervocalically than for g to. But it did surprise me that even the distinctively aspirated k can get voiced intervocalically in jökull. Do you agree with me that that is what is happening in that recording? I think they are making way too much of the situation. Iceland needs a boost no more discouraging news about this poor country!